A LOVER OF languages and of literature — the name of this website is Owenna’shon:a, or words — as well as of all related matters, I’ve put together over the years a decent collection of the various tools of the trade. A recent move and downsizing compelled me to get rid of my 1952 Corona Silent typewriter, but I have kept (among other things) my writing papers and blank books and cards and my lap-desk. As I’ve noted elsewhere, I have a stationery fetish with an emphasis on the fountain pen. I don’t expect anyone not afflicted likewise to understand, and so what follows is less an attempt to bring you around to my view of things than a mere indulgence. 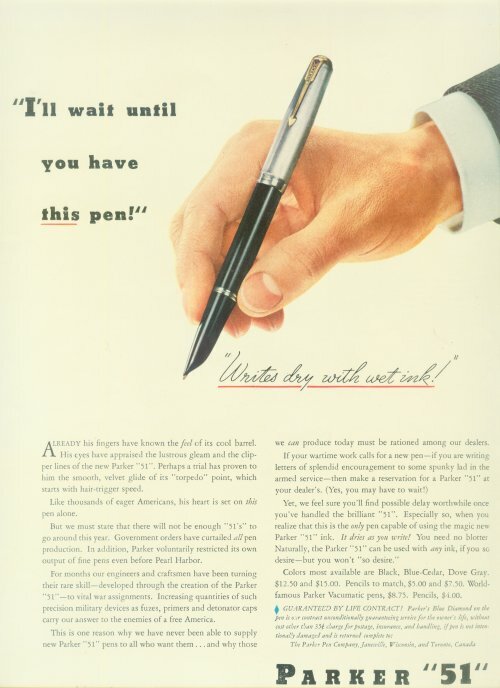 Almost every year, from the early 1940s until the 1960s, the Parker Pen Company ran a Christmas ad in Life Magazine. The image above is taken from a December 1943 edition, printed at a time when war production had diverted steel and plastics away from non-essential uses and toward weapons production. I have the very pen featured above in my collection: a Parker “51” (mine is a Cedar Blue “vacumatic”). During the war these pens were in sufficient demand, and the production sufficiently curtailed, that there was a waiting list of prospective buyers. A luxury item, a pen such as this would be had only as a gift, and only at a special occasion such as Christmas. (In this respect it is like its modern-day equivalent, the Montblanc Meisterstück 149, one of which was given to me by my parents on my 40th birthday.) In recognition of this fact, my 51 has been recently inked for the holidays and now rests at my elbow, ready for duty. It’s a small and perhaps strange ritual, until now known only to myself, but it’s far from hollow. It is possible, if only slightly, that my pen was held by a soldier overseas. What is certain is that a good number of these pens were purchased for enlisted boyfriends and spouses and sons, home briefly for the holiday, and that from across the ocean came the letters thereby composed. A pen was still something of a relative rarity at the time of the war (pencils being more common), and even in the era when a pen was an object of considerable craft and engineering effort and expense, the Parker 51 was considered extraordinary and would have been a gift of exquisite character. Still avidly sought and highly regarded, a Parker 51 properly restored will fetch anywhere between $60 and $500, depending on the model, colour, and condition. The thought of coming home from a far-away foreign land and receiving a rare and precious gift, within the general conditions of deprivation and boredom and nastiness imposed by war, is hard to outdo as a representation of the aesthetic ideals of the holiday. True, a luxurious gift may to some underscore the materialism of the season. For me, however, the 51 also makes a statement about the importance of craftsmanship, the dignity of reliable and durable objects whose purpose is to introduce pleasure into simple and common human acts — in this case, the human act of writing. It seems bizarre that someone near the front would engage in something as unnecessarily preposterous as filling an ink pen to write a letter, but seen from another angle it is a gesture of defiance, an attempt to bring a piece of civilization into a world gone mad. (As an aside, I’ll note that watching some war footage I did once catch a momentary glimpse of a soldier writing a letter in the field with a Parker Vacumatic Duofold.) That’s at least how I would hope to see things were I in that unfortunate position facing the same humiliating barbarisms. 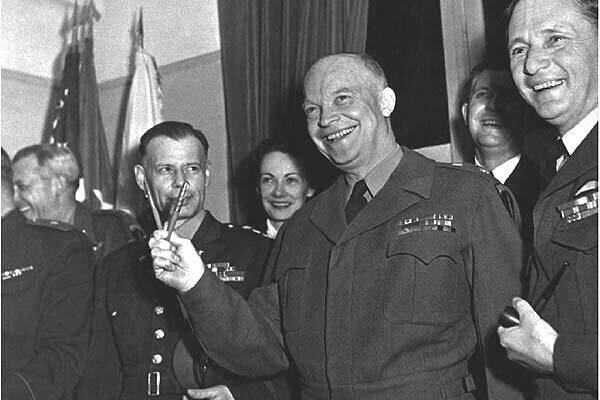 Eventually the war ended, and when General Eisenhower was called upon to sign the papers confirming the German surrender, it was the future President’s two Parker 51s which were pressed into this service. 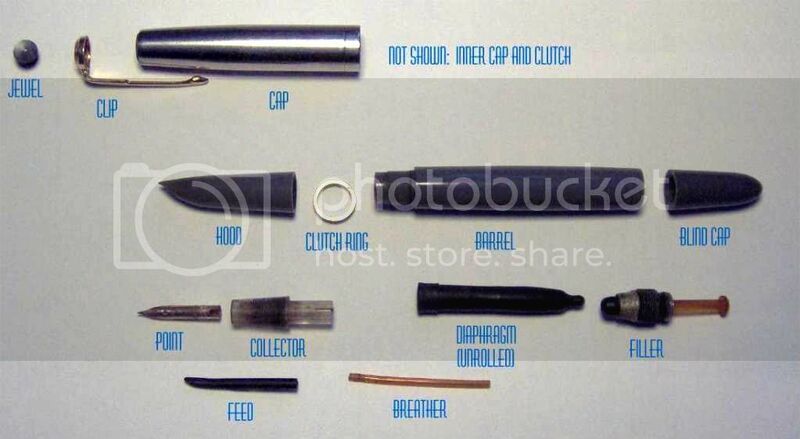 All of this, and much more, is part of the material history of the Parker 51, considered by many to be the best fountain pen (if not the best pen) ever made. Americans were never more prosperous, nor more confident, nor more ready to rise to the occasion than during the era which yielded this engineering and aesthetic marvel. Under how many Christmas trees these appeared after 1941 I am unable to say. But in each instance their appearance would have marked an occasion of singular extravagance, serving over the coming years to provide daily pleasure and reminders of what human ingenuity and dedication to excellence and beauty can accomplish. This entry was posted in Personal Essay and tagged Christmas, Fountain Pens, Life Magazine, Parker 51, Second World War, World War II. Bookmark the permalink.